NBA Live 14 is a next-gen game, but not for the reasons you'd expect. Its graphics aren’t amazing, nor does it offer astounding, never-seen-before gameplay. In fact, for the first time ever, a major-label sports game arrives on store shelves as a work-in-progress. See, Live is wholly dependent upon a constant, daily stream of updates that the Xbox One and PS4 were designed to facilitate. The Live that you play today will not be the same one you’re playing in a few months. But on launch day, it arrives as an ambitious effort that has a bevy of terrific ideas, surprisingly strong gameplay in some areas, and a baffling number of problems in others. Where it goes from here will be very interesting indeed. Live’s weaknesses are easy to spot. The on-court gameplay doesn't look very next-gen-like, especially when compared to its NBA 2K14 counterpart. Player models are nicely detailed when viewed up close and during replays; when you’re playing the game from standard camera angles, however, the player, coach, and referee faces look as if you’re viewing them through smudged glass. The camera struggles when players go up for rebounds, and there are plenty of awkward bounces of the ball coming off the rim and blocked shots. With scattershot animations and regular hiccups, it’s an uneven visual experience overall. Underneath that rough exterior, however, NBA Live does offer some interesting options for individual and team control in the standard 5-on-5 game modes. Much has been made about the integration of Synergy Sports data that powers the behavior of players not directly controlled by the user, and it’s evident when playing a standard game just how powerful that can be. You’ll often notice particularly smart patterns of positioning and screening by your teammates, based on their real-life individual strengths. You can feel the weight of the players as you move around the court, and their momentum forces you to be smart about your actions. Newcomers will easily be able to pick up and play, thanks to mercifully simple basic commands to pass, shoot, and jump. Plays are called with the click of the d-pad, and modifiers allow for deeper options that open up several variations of screens, isolations, and post ups. A multitude of pass types are available as well, and after some experimentation you’ll be able to toss a bounce or lead pass with ease. Calling for screens--always a key to success--is brilliantly done with the left trigger; hold it down to set the screen then release it for the screener to return to their regular spot on the floor. Discovering the correct timing for successful shooting, though, is pure trial-and-error. Blink and you’ll miss the indicator that you shot the ball well from the top of the jump--and because different players have different timing, it’s extremely frustrating at the start. Even more troublesome is foul shooting, which has no indication at all of how and when to release the ball. The lack of a practice mode to hone your skills or training area to learn how to shoot--much less study the deep controls--is a gaping hole that needs to be filled. Several other expected modes of play are unfortunately MIA as well, including online leagues and team up. There are Online Head to Head Seasons, though, which is something at least. One of Live’s differentiators is the constantly-updating set of Challenges based on real-world NBA events. As separate micro-games from the standard game modes, they let you pop in and attempt to replicate a multitude of moments such as hitting a game-winning shot or garnering a specific number of steals by a player. Every day more are added to the menu, and they’re matched to leaderboards that allow you to compare your accomplishments to those of your friends. Unfortunately--at least at launch--these suffer from a number of glitches and bugs. Crowd audio suddenly disappears, trapping you in a bizarro world the sounds of balls bouncing and commentators speaking are all that can be heard in what’s otherwise a vacuum. You see the audience cheering, yet they don’t make a peep, and, as if suddenly aware of the strange preceding events, a player will freeze in place for 10 seconds in a pose straight out of an old MC Hammer video. Then, to top it all off, Paul Pierce will decide he wants nothing more to do with the game and run off the court, staying stuck in a jogging animation once he reaches the crowd. Only a reboot can save you from the horror. Another one of Live’s biggest flaws makes itself most evident in Rising Star mode (which apes NBA 2K’s My Career in many ways) when you’re locked into a single position player. Unless you’re a point guard, your career on the court is... bizarre. Your offensive teammates often stand around doing nothing, waiting patiently for the point guard to heave up a three when the shot clock gets to zero. But you can completely dominate the game by constantly calling for the ball and hurling shots with impunity, even if you miss a dozen in a row. In real basketball, the coach would yank you off the court and publicly flog you (unless your name is Kobe Bryant). In NBA Live, coach is totally cool with that. The ESPN wrapper around Live, however, is beautiful. Pre- and post-game coverage is hosted by Jalen Rose, and the halftime show featuring Wired for Sound segments of coaches calling out instructions to the players is fantastic. In-game commentary from Mike Breen and Jeff Van Gundy is solid if not spectacular. For all the good insight they offer, sometimes Van Gundy will make blatantly incorrect statements, such as the time he referred to Kevin Garnett as an offensively challenged player that had no business taking shots. If KG had heard that, he’d walk right over to Van Grundy and smack him silly. EA has promised to support NBA Live from the moment it’s released through the entire season--and the game clearly needs it. The core gameplay can be fun, and hopefully a series of updates will smooth out the kinks and improve the overall experience on the court. Anyone purchasing Live needs to go in with their eyes wide open, knowing that while there are some terrific ideas on display, there are also basic components that are under-developed or flat-out missing. 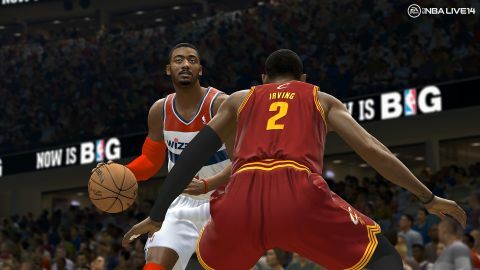 As an NBA platform, Live makes a welcome return and takes advantage of what the next-generation consoles are offering. As a game, it's got some serious problems. EA has an opportunity to re-establish itself in the space after a series of unfortunate events have plagued the series in the past. Here’s hoping it makes good on that. Description Fueled by the EA Sports Ignite engine to create a real-world NBA experience.